Looking back to the period after World War II finished in 1945, as young lads we certainly had a lot of celebrating to do. That dreaded War that we had heard so much talk about was at last over. We certainly were delighted, that at last things would be improving and for us teenagers especially. 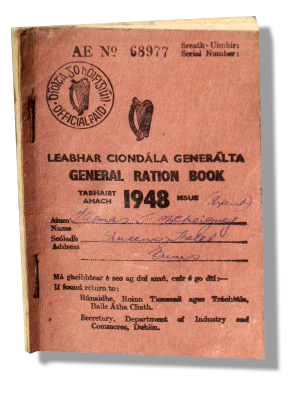 We would soon be able to buy our favourite fruits – oranges, bananas and grapes which were not available at all here for those six terrible years of war. The other advantage we also hoped for was electric light and power in the home and in the towns. It was a terrible existence without these facilities and we could hardly wait. But we knew it would take some time before this was accomplished. But it’s amazing how rapidly things began to take shape. In just a few short years the country was buzzing with sounds of machinery that we had never heard of before, brought in to clear the countryside of rocks and bushes in the Land Project. Also the country was soon dotted with miles and miles of pylons, being erected to carry electricity to every home in the country, Ireland was now really awakening after years of inactivity. New houses were being built in double quick time and huge estates were now visible all over the country. Many young people had left here before and during the war to seek employment in England and the US. Some of them returned when this boom began and were delighted to get the chance to return home. By the summer of 1951 things were really improving. The tourist trade was booming. 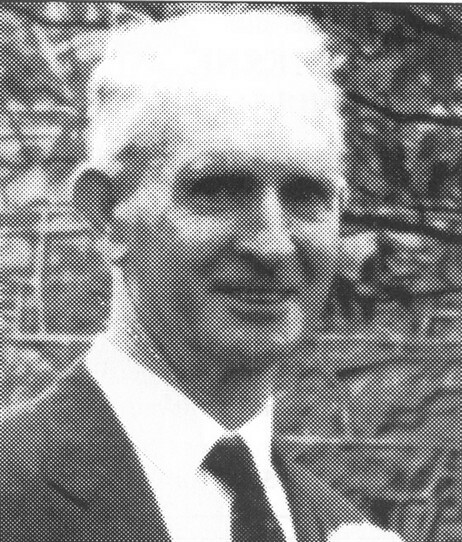 This was very evident here in the west as the tourist boom was taking shape with hordes of fishermen descending on Lough Corrib and on most of Connemara’s lakes. New hotels and guesthouses were springing up all around the place. The schoolchildren collected all the mayflies they could carry and they sold them to the incoming fishermen. This was the start of the trout fishing on Lough Corrib. The older schoolgirls got nice jobs for themselves as hotel managers, waitresses in the hotels and guesthouses. The fact that so many had left home now didn’t seem to matter as the vacancies created had now been filled by the younger generation. So everybody was happy. As night approached when dinner was over, things came alive to the sounds of all kinds of music. 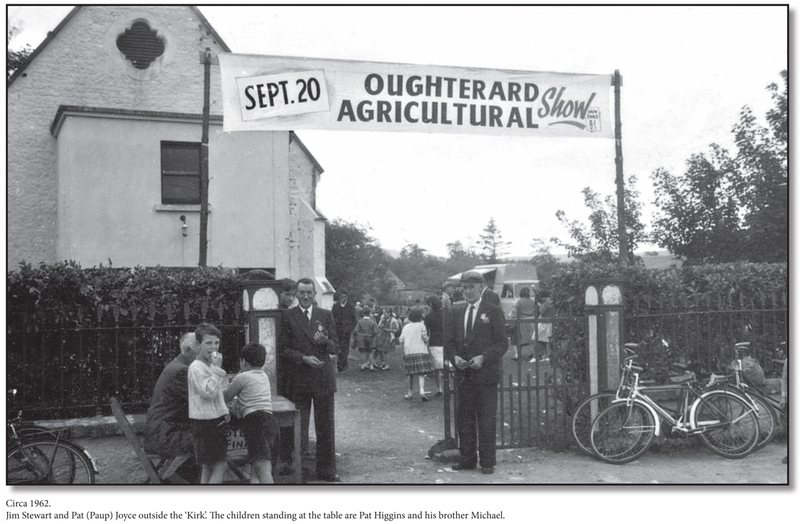 There were two halls in Oughterard that time, the Kirk and Sullivan’s Hall. All tastes were catered for – Ceilí music and modern too, wonderful variety and a great choice for all. The halls were usually packed, we had some great bands appearing, bands like the Kingstonband and bands from Connemara and from Mayo as well. Great musicians such as Paddy Conry from Maam, Bunny Joyce from Cleggan, The Diskin Bros from Corr na Mona. Johnny being a first prize winner at Feis Ceol an Iarthir, playing the fiddle, what a genius he was. There also was a band from Ballinrobe which had a marvellous accordion player named Jim Farrager. Those were the times, the jobs were appreciated and so were the leisure hours, it was a happy time. Well the west continued to thrive as time went on and it became one of the major tourist spots in the country for many years. The town of Moycullen began to improve quite early as well. There were two halls there too and they seemed to be doing alright as they catered for both Ceilí and modern music too. I remember getting a weekly gig with Bernie Walsh and Martin Coyne playing in the old parish hall, situated where Áras Uilinn is today and we had many great Ceilís there for about three winters. I still remember The Bouncy Floor – very enjoyable! I was sad leaving it all behind but I had to depart at the time because I had just got a call for training as a bus conductor and at last a permanent job beckoned, but I managed to keep in touch with the bit of Ceilí . 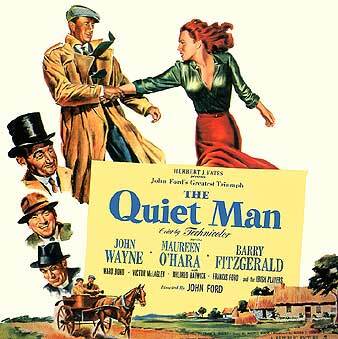 1951 was particularly exciting here in Ireland, especially in Cong, Co Mayo as this was the year that The Quiet Man was filmed there and in many areas of Connemara as well. It was the first film to be made here and it attracted thousands of extra visitors to the west. Cong was the focal point of the film but many other venues were used as well. All of these areas are now quite popular with natives and tourists alike. The film was brilliant with plenty of action and laughs too. We still love to see this film being shown on TV. Such happy memories it conjures up for especially to those of us who were lucky enough to have met the stars of this film. I was one of the lucky ones to have met most of the great cast of the film when they came to Spiddal for a charity event. We got their autographs and a handshake from each. What a day! The summer of ’51 was one of the hottest in memory. We also got another “hot one” in 1955. That was a real sizzler too. It was also the year of the travelling road shows, travelling around the country presenting great stage shows as they went. They would remain in the same venue for their full programme and then move on to the next parish. Many of these shows were often accompanied by film shows as well, giving plenty of variety all round. There was a lot of card playing going on in the pubs at night and in the neighbouring houses too, especially coming near Christmas when turkeys were eagerly sought by everybody making the 25 card game the most sought after. Card playing was always popular, especially in rural Ireland. With all things said and done the ‘50s were a great time to be around and I for one really enjoyed every minute of the memorable decade. This page was added on 23/09/2013.